The franchise "strongly supports" the officers. From Starbucks to Applebee’s to IHOP, getting fair customer service can sometimes be impossible when you are Black. 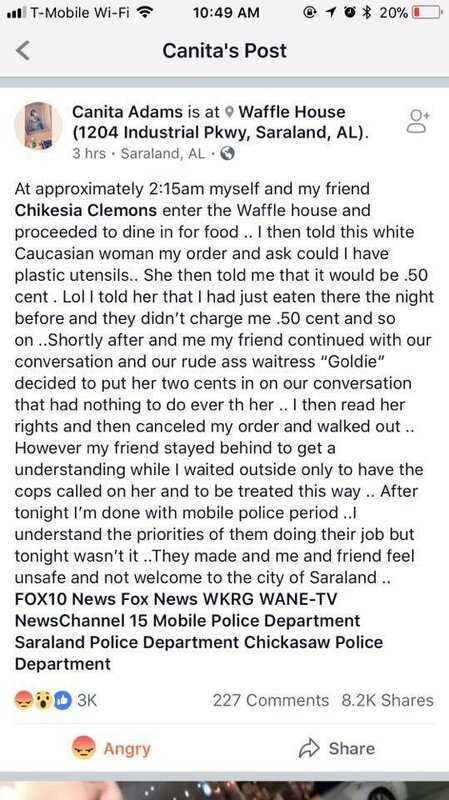 This was the case for Canita Adams and Chikesia Clemons at a Waffle House in Saraland, Alabama. Waffle House responded to the incident by telling AL.com, “It’s fair to say that the information we have received at this point differs significantly from what has reportedly been attributed to Ms. Clemons and strongly supports the actions taken by the Saraland Police Department. The Saraland Police Department is conducting its own investigation and we encourage you to contact them for additional information.” Yep, you read that right “strongly supports.” Sounds like Waffle House might need the Starbucks treatment. Clemons was booked on charges of disorderly conduct and resisting arrest. She was released on $1,000 bond Sunday morning. Mobile NAACP President David Smith said the following in a released statement: “In light of the current situation in our country — such as the arrest of two young Black men at a Philadelphia Starbucks coffee shop — we felt it was important for our members to get a first-hand account of the incident, which has now gone viral on social media locally and across the country. When incidents like this happen in our own backyard, it is incumbent upon the local NAACP to take a closer look and move the matter to whatever level is appropriate.” The NAACP will reportedly be meeting with the Canita and Chikesia. As we know, people of color are big supporters of Waffle House. As consumers, we truly need to consider where we spend our money — especially when Waffle House is so quick to “strongly support” the officers. In addition, how ironic that this incident goes viral on Alabama’s Confederate Memorial Day, which celebrates the racists who wanted to dismantle the country. Stay woke.